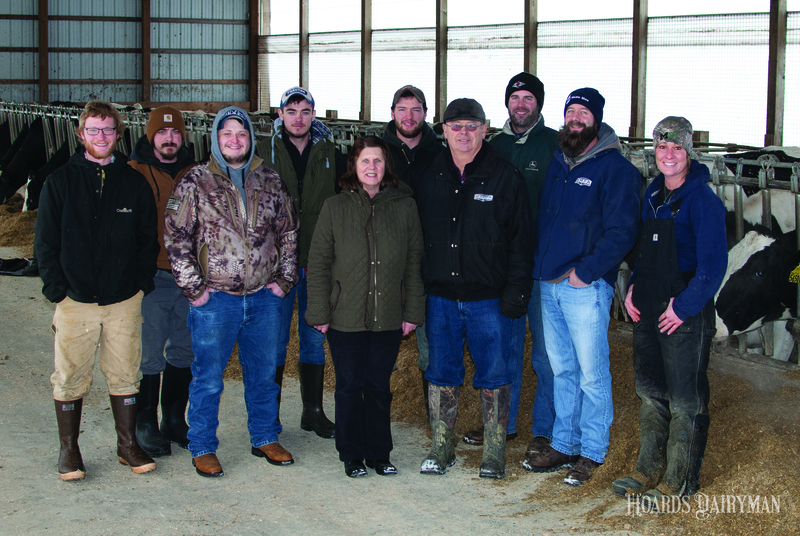 The platinum award winning MMPA farm includes the team of (R to L): Jenn Buchner, Jeremy Werth, Paul Werth, Larry and Paulette Werth, Evan Beyer (behind Larry Paulette), Austin Malaney, Josh Jones, CJ Malaney and Ethan Buchinger. Photo credit: Corey Gieger, Hoard’s Dairyman. Seventeen Michigan Milk Producers Association (MMPA) member farms were today awarded National Dairy Quality Awards, making up over a third of the total winners. The MMPA members made up over one third of the 46 nationally recognized farms in the annual award program. One platinum award, seven gold awards and nine silver awards were earned by MMPA members. MMPA’s large representation in the National Dairy Quality Awards underscores the hard work of the cooperative’s farms while competing against other well-performing farmers across the country. National Dairy Quality Award winners are recognized at the annual National Mastitis Council meeting held this week in Tuscon, Arizona. MMPA offers a portfolio of member services to help members produce the highest quality milk possible, with field representatives working closely with each member to achieve quality goals. MMPA also offers a quality premium incentive for its members producing higher quality milk. In 2017, MMPA paid out $17.7 million to members in quality premiums. The winners were selected from a pool of applicants nationwide. The winning operations stood out for having produced high-quality milk consistently. Applications were evaluated for measures of quality, systems of monitoring udder health, milking routine, protocols for detection and treatment of clinical and subclinical cases of mastitis and strategies for overall herd health and welfare. MMPA winners were nominated by their member representatives. Michigan Milk Producers Association, established in 1916, is a member-owned and controlled milk-marketing cooperative serving approximately 1,700 dairy farmers in Michigan, Indiana, Wisconsin and Ohio.